Cimorene is everything a princess is not supposed to be: headstrong, tomboyish, smart - and bored. So bored that she runs away to live with a dragon - and finds the family and excitement she's been looking for. A few weeks ago, I was in a reading slump. I wasn't interested in reading any of the books I was currently reading. In the past, I would probably just stop reading for a few months (or even years). This time around, I decided to think of a way to get motivated to read again. I decided that my next book needed three things: (1) to be short, (2)an audio book [so the pages kept turning no matter what & I could multitask], and (3) guaranteed to be a good time. The audio books for Dealing with Dragons and Searching for Dragons were the perfect fit. 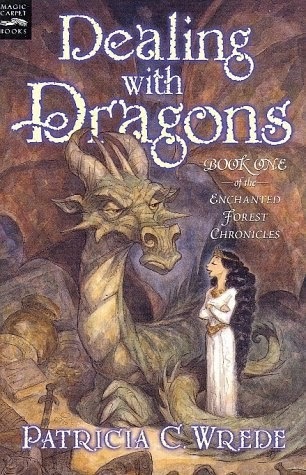 Dealing with Dragons and Searching for Dragons are the first two books in the Enchanted Forest Chronicles. The first three books in the YA quartet focus primarily on Cimorene. Cimorene is a princess who doesn't like all of the typical princess things like etiquette and waltzing. In order to avoid an arranged marriage, she runs away to live with dragons. Dealing with Dragons focuses on Cimorene's first few months (first year?) of life with the dragons. Searching for Dragons deals with the adventure that Cimorene and Mendabar (the King of the Enchanted Forest) go on when the King of the Dragons goes missing. I love the Enchanted Forest Chronicles so much. The series is fun, witty, and just plain fantastic. (I may be a bit biased after the upteenth readings of this series). Although I love the entire series, I really love the first two books. You can read books one, two, and four as stand alone stories. Book three ends on a bit of a cliffhanger. Okay, I should probably explain why I love these first two books so much. 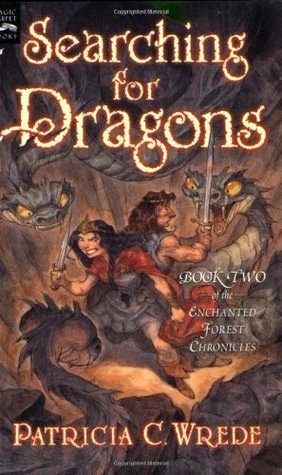 When I discovered this series I was in sixth or seventh grade, most of the fantasy series I read had male protagonists. I was desperately seeking a series with a strong and likeable female protagonist. Cimorene was perfect for me. Cimorene was everything I wanted to be when I was 12-13 years old: beautiful, smart, witty, adventurous, and fun. Mendabar was everything that I wanted in a guy. I loved inserting myself into these stories (and going on adventures with Mendabar). Cimorene and Mendabar are a bit perfect; however, this is a young (Cimorene is 18 or so but I read the series when I was a tween or a young teen, so I am classifying it as young YA), YA series and it is a fun, light-hearted fantasy series. It makes sense that the characters are a bit trope-y. In addition to Cimorene and Mendabar, this series hosts a series of fun secondary characters like Morwen who is a witch and Telemain who is a magician. My favorite character outside of Cimorene and Mendabar is Herman, a dwarf. He is only in two scenes in Searching for Dragons, but he makes a great impression. Herman is a descendant of Rumpelstiltskin. Unlike his great, great, great, great grandfather, when he makes the name agreement with princesses, they can't figure out his name and he gets stuck with the kids. When we meet him in Searching for Dragons, he has a lot of kids for whom he is a guardian. Now I could read this series just for the characters, but the plots and adventures are great too. The main story lines are fairly simple; however, they are a great ride. Wrede does a great job of interweaving fairy tale stories together into a unified plot. For example, in Searching for Dragons, Cimorene and Mendabar are searching for the King of the Dragons. Along the way, they meet some giants, dwarves, a magician, and some evil wizards. The adventures are exciting and make sense within the universe. Wrede has a great wit, and each chapter will make you smile. Audio: This is the first time I listened to the audio books. The cast did a great job with the voices. Some of the voices were a bit jarring, because I had voices for all of the characters in my head and some of the cast voices didn't match my voices. The tone, inflection, and pacing were all quite good. The sound quality was not the best. At times I could hear a crackle in the background, especially when Cimorene spoke. This may have just been my copy (I got the audio book from my library's Overdrive site). As you can probably guess, I am giving both of these books a 5 out 5. If you are in the mood for a fun, fantasy, young YA series, the Enchanted Forest Chronicles is where it's at!